It's a Spear@Jackson (Sheffield). It has a feature that nobody can tell me what it is for. 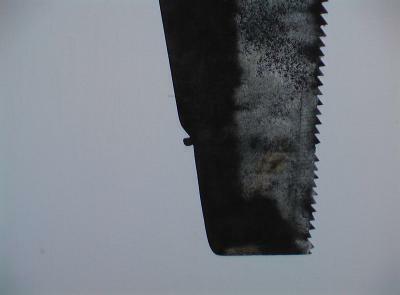 It's the little nubb that sticks up on the back of the saw about 3" back from the nose. I've attached a picture. Thank's for helping me figure this out. Interesting comments all. The real purpose of this was to tie a cord around a blade guard, the other end would tie around the handle. The nib would cause the cord/string to keep from sliding forward toward the front of the saw. You can affirm this at Jamestown, Virginia, as this was brought over long before Disston started using it as decorative. A lot of stories try to explain this feature on early saws -- starting the cut (why would you use a dull edge to start a cut?! ), a notch for binding a bunch of the saws for shipping, etc. All the stories are wrong. It was just for "purties," a decorative touch. Some much earlier saws have even more elaborate decorations on the tip of the blade. I have often wondered this as well. I would guess it is simply a hold fast, a shape on an otherwise flat, thin edge to get a grip with the crease of a finger of the slack hand to guide the blade in the first few passes. You are asking a question that I have heard a lot of discussion on: What is the "nib" on the top of my old saw used for? I have heard a lot of "answers" like the other comment about it being used to start a cut: try it, it doesn't work! At least not as well as pulling the saw backwards (toward you) a couple of times to start a cut. I have also heard the explanation that it is like the sights on a gun (you're supposed to aim before you shoot a cut?) This one is equally ridiculous. I had the opportunity to talk with Donald Rosebrook, an authority on antique tools and he told me that Henry Disston who designed and manufactured the first saws with a nib said it was purely decoration. You use this nub to start your cut accurately. Flip the saw upside down and sight down the blade laying the back right where your mark is and rub that nub over the spot where you want to start your cut.